DO WHATEVER HE TELLS YOU. This Sunday, we continue with yet another epiphany or manifestation of the Lord. In today's Gospel (John 2:1-11) Jesus manifests himself with his first public miracle. His mother, who wanted to save the wedding hosts the embarrassment of running out of wine, asked her seemingly reluctant son to do something about it. Then, in utter faith in her son, she simply said to the servers, "Do whatever he tells you." "Now there were six stone water jars there for Jewish ceremonial washings, each holding twenty to thirty gallons. Jesus told them, 'Fill the jars with water.' So they filled them to the brim. Then he told them, 'Draw some out now and take it to the headwaiter.' So they took it. 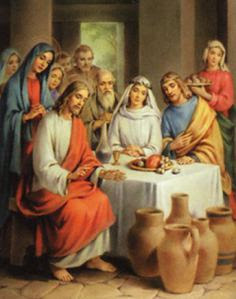 And when the headwaiter tasted the water that had become wine, without knowing where it came from - although the servers who had drawn the water knew -, the headwaiter called the bridegroom and said to him, 'Everyone serves good wine first, and then when people have drunk freely, an inferior one; but you have kept the good wine until now.' Jesus did this as the beginning of his signs at Cana in Galilee and so revealed his glory, and his disciples began to believe in him." In our first reading (Isaiah 62:1-5), we hear of God's boundless mercy and love as Israel's exile comes to an end and their "vindication shines forth like the dawn". Isaiah uses the imagery of the wedding and the espoused to underscore God's love for his people. "No more shall people call you 'Forsaken,' or your land 'Desolate,' but you shall be called 'My Delight,' and your land 'Espoused.' For the LORD delights in you and makes your land his spouse. As a young man marries a virgin, your Builder shall marry you; and as a bridegroom rejoices in his bride so shall your God rejoice in you." In our Epistle reading (1 Corinthians 12:4-11), St. Paul writes to the people in Corinth to remind them (and us) that God manifests himself in each of us through the spiritual gifts he gives to us, each one unique and according to God's design for us. "There are different kinds of spiritual gifts but the same Spirit; there are different forms of service but the same Lord; there are different workings but the same God who produces all of them in everyone. To each individual the manifestation of the Spirit is given for some benefit. To one is given through the Spirit the expression of wisdom; to another, the expression of knowledge according to the same Spirit; to another, faith by the same Spirit; to another, gifts of healing by the one Spirit . . . . But one and the same Spirit produces all of these, distributing them individually to each person as he wishes." God frequently uses the metaphor of the intimacy of marriage, with he as the spouse and his Church (us) as his bride. There can be no doubt the love God has for us - exceeding even the love only a spouse could know or a parent could know for a child. We could do well to rest in his arms and feel the warmth of his love and his mercy. And also, to follow the directive of his dear Blessed Mother - "Do whatever he tells you."